Recently the Rockstar Baba was honored with Dadasaheb Phalke Film Foundations Award for most popular Actor, Director and Writer, this time its even bigger, this time he has won four Platinum Plaques from International Phonographic Industry for music of his first movie MSG The Messenger. During celebration of Dera Sacha Sauda’s Foundation Day held in Sirsa, on Friday, 29thApril, Saint Dr. Gurmeet Ram Rahim Singh Ji Insan was honoured with Platinum Plaques for MSG’s debut Film, MSG -The Messenger’s Sound Track. 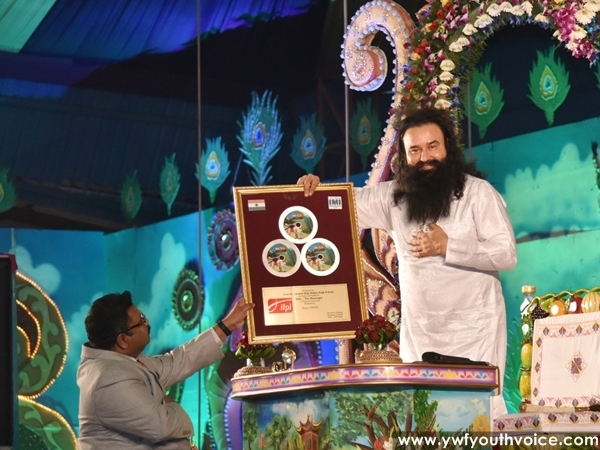 Mr. Savio C D’souza, Secretary General of IFPI (The International Federation of the Phonographic Industry) in India, presented 4 Platinum Plaques to Saint Dr.MSG for four categories - Vocals, Lyrics, Composition and Music Direction. IFPI is the voice of the recording industry worldwide. It represent the interests of 1,300 record companies from across the globe including 57 categories and 61 markets where their member companies operate. Mr. Savio D’Souza mentioned that the Platinum Plaque being presented to Saint Dr. MSG, for Triple Platinum sales of the sound track of MSG-The Messenger. The Platinum category is the highest sales category worldwide and this Plaque hasn't been given to any Indian since 2002. Saint Dr. Gurmeet Ram Rahim Singh Ji Insan was awarded with one more Plaque by Mr. Rajat Kakkar, Managing Director – Sony DADC India on behalf of Mr. Markus Streibl, Head of Global Licence Business, SONY DADC International, for 1 Million (10 lakhs) sales of CDs and DVDs of MSG The Messenger. To celebrate the success of MSG-The Messenger, Saint Dr. Gurmeet Ram Rahim Singh Ji Insan launched limited edition package of MSG 1-Audio and Video. Also, the DVD of MSG 2 The Messenger was released on this special occasion, MSG 2 is still in the cinemas even after 32 weeks of its release. MSG 2 is reaching even bigger heights, who would have thought that a Saint, a Baba can shake the Bollywood? can make his country proud by winning such huge awards, Love Charger baba, a beautiful short article "Perception" is a must read to know more about Dr. MSG.